UNStudio has won a competition to design a new cinema and cultural centre with weathering steel walls and green roofs as part of BIG's EuropaCity masterplan on the outskirts of Paris. The three intertwined volumes of weathering steel comprising the Centre Culturel dédié au 7ème Art will house a cinema and "cultural laboratory" featuring both indoor and outdoor screens. EuropaCity is a £2.74 billion tourism and leisure district has been masterplanned by Danish practice BIG, and the competition asked firms to pitch to build eight key buildings in the development. These also included hotels, a concert hall, an exhibition hall, and a contemporary circus. BIG's central concept for the EuropaCity masterplan was 'rolling hills', and Dutch studio UNStudio has responded with designs for sloping rooftop terraces carpeted in greenery that will offer panoramic views over Paris. These terraces will host large screens as well as restaurants and cafes, making the Centre Culturel a public destination. 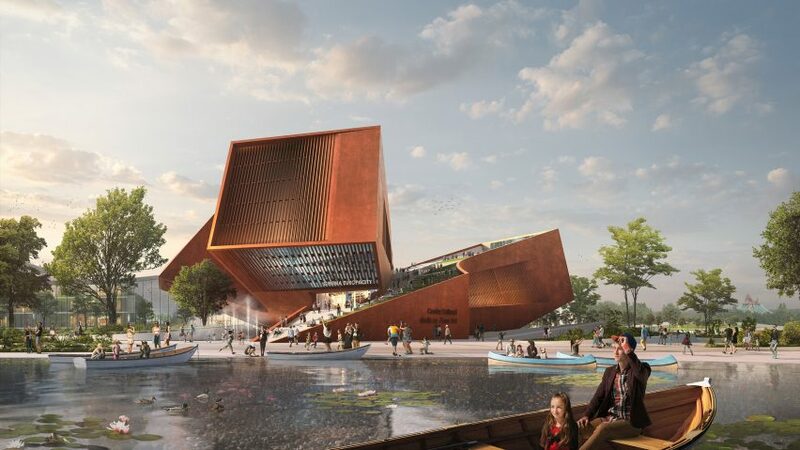 "For the design of the Centre Culturel we were inspired by the 'Cinéma en plein air' culture, and we wanted to celebrate the art of film-making," said UNStudio founder Ben van Berkel. "We have created a building where you can both produce and enjoy film as a shared experience," he added. Facades of pre-weathered steel were chosen, according to the architects, to evoke large scale landscape sculptures. The material is favoured for outdoor installations for it's resilience and the pleasing aesthetics of its natural patination. New York designer Dror Benshetrit created a giant wine rack in the material for a New Zealand vineyard. There were plans to set a walkable ring of weathering steel outside a castle in Wales, until plans were scrapped following fierce resistance from locals. Along with the outdoor cinema experience at the Centre Culturel, UNStudio will facilitate a more traditional black box-style cinema for indoor screenings. "Cinemas are the perfect example of concealed architecture. The cinema is the one type of building that becomes invisible once you step inside it. You spend up to two hours in a darkened room, immersed in the alternative space and time of the imagination…and then you leave," explained van Berkel. "This limited user experience of the cinema as a venue led to the key concept that drove our design: the desire to create a building that in its totality offers a much more extensive experience of cinema." Each of the the three blocks containing the cinema halls will be organised according to genre of films, with each volume organised into three different "clusters". The intersecting spaces converge in a shared foyer that overlooks the level below where training and production studios are located, giving visitors a view of movie-making in progress. In order to fit seamlessly into the larger masterplan, the sloping roofs of the Centre Culturel should not block sunlight from reaching the planned hotel next door. The carved and tilted angles of the volumes were also calculated to ensure the roof decks caught the maximum amount of sunlight and the minimum amount of wind. Perforations in the steel facade will be added to channel the prevailing wind and naturally ventilate the indoor spaces. The rooftop vegetation will provide a layer of thermal insulation, reducing heat loss via the ceilings and preventing the spaces below from absorbing too much heat. UNStudio has also just been announced as the winner of a bid to build a new cable car in Gothenburg, Sweden. The Amsterdam-based studio is also set to build a tower in Dubai that will have the "world's tallest ceramic facade". Masterplanner BIG is also building new offices for Google in Sunnydale California that will feature a terraced rooftop garden with a pedestrian path zig-zagging up the side. For job opportunities at UNStudio, visit their company profile on Dezeen Jobs.